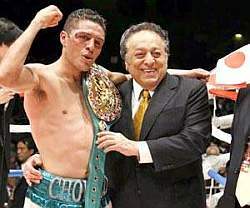 TOKYO -- Oscar Larios of Mexico picked himself off the canvas to outpoint Takahiro Aoh for a split points decision victory to defend the World Boxing Council featherweight title on Thursday. Three American judges scored it 115-111 and 114-112 for the defending champion and 114-112 for the Japanese challenger. Aoh fired a counter right hook and then connected a left to floor 31-year-old Larios in the fourth round, in which the Mexican also cut his right eyelid after an accidental butting. Larios, who in the fifth was left staggering after another effective Aoh counter, changed tactics thereafter and fought cautiously using an array of effective left jabs. He piled up points in the following rounds hitting right hooks and straights. It was his second defense of the title, stretching his record to 64 wins, including 42 KOs, six defeats and one draw. Top photo: Oscar Larios of Mexico (L) poses with WBC President Jose Sulaiman after his narrow victory over Takahiro Aoh in Japan Thursday. AFP Photo.